Evans easy shine is a multi-use floorcare product designed to provide excellent results when time is of a premium. 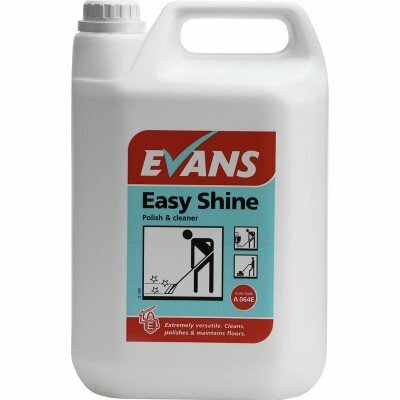 Evans easy shine is suitable for use as a cleaner, polish & a floor maintainer on most floors including vinyl, rubber, asphalt, marble, terrazzo & sealed surfaces. Apply two thin coats to a clean neutral floor. Allow each coat to dry. Dilute 1:10 with cold water (500ml per 5lt) 2½ cupsful per 5lt. To improve the gloss dry burnish with a white floor pad in conjunction with a high-speed machine. Dilute 1:60 with cold water (8ml per 500ml) 1 tbsp per 500ml-spray bottle. Spray floor lightly. Burnish to a shine, using a red floor pad in conjunction with a high-speed machine. Q: Does this product have any fragrance? A: This product has a slight perfumed fragrance to it.